Long lists intimidate me. I'm skeptical of their fancy promises. 101 places you can hide your elf on the shelf! 500 uses for dryer lint! 28 ways you can improve your routines! More like 28 ways you didn't know you were doing it wrong all along. A few years back, I heard I wasn't supposed to put many citrus peels in the compost. I've since learned that old rule isn't true, but it sparked my interest in finding other ways to use the peels. I looked for how-tos on the interwebs. One suggested I should keep my peels in a giant bag in the chest freezer. Good idea! But wait, she wasn't finished. Then, when the bag was full, I should put all the peels on a baking sheet and dehydrate them in a warm oven for many hours. THEN, I should grind those dehydrated peels into powder, and only after all those steps could I turn them into a scouring scrub. Ain't nobody got time for all that. I'm not making any promises or offering long lists today. 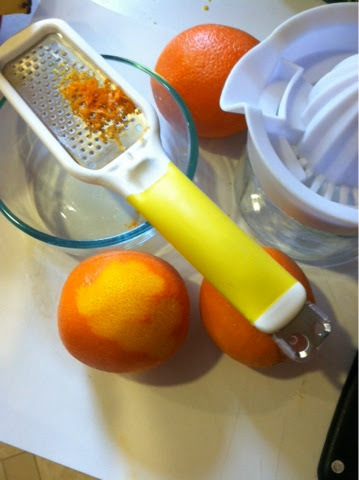 I'll just tell you the three ways I store my leftover citrus peels right when I'm cutting up the fruit. It will take you thirty seconds longer than tossing them in the garbage, and I promise (okay, one promise) you'll be glad you have them on hand. Rhythm of the Home's Holiday edition is out today! Check out my article about simplifying our kids' toys. I'll be conducting our "pre-holiday purge" soon. Care to join me? Author's note: You can read my past contributions to Rhythm of the Home here. Last week I rolled up our winter rug and cleaned it to put it in storage. I am still trying to decide whether I want to buy a rug for summer or leave the floor bare. What do you do? I was telling Nate about my dilemma when he responded, completely without sarcasm, "But a rug really ties the room together." I paused mid-way up the stairs, laundry basket in hand, and leaned back my head for a deep rolling belly chuckle. His earnest appreciation for floor coverings smacked so much of The Dude--and so unintentionally so! My favorite times are when one of us is being funny without knowing it. It is truly the best way to get a laugh. In case you would like to share in my rug-cleaning fun, I am sharing a new article I wrote about how to clean your area rugs. I partnered as a guest writer with the folks at Home Made Simple, a website with inspiring methods for organization, cleaning, and cooking. They offer some great ideas and resources, and I am shamelessly encouraging you to head over there today and check out what I wrote! El Duderino would no doubt agree with me that a clean rug really spruces up your living room. If you need further encouragement to read my article, consider the fact that I used the word "sparkle." No, really. How are you doing on your New Year's resolutions? I wised up this year and didn't announce my resolutions, thereby (in theory) circumventing guilt when I did not fulfill them. However, being a person who seeks self-improvement, I did make some mental notes on areas of my life and home I'd like to tinker with this year. One area I highlighted for renovation is the kitchen. But despite loads of inspiration on my Pinterest boards, I am having trouble getting started. Cue those guilty feelings. With the beginning of March comes thoughts of spring cleaning, so it feels like a good time to put aside the fear and guilt and get moving on some of those resolutions. Today I'm bringing in a guest with expertise in the field of home improvement, and she's going to give us some frugal ideas for where to begin on updating your kitchen. Be sure to read to the bottom for Jillian's bio. Take it away, Jillian! This year when you're doing your annual spring cleaning, don't just clear out the clutter from your kitchen; make it better by improving the organization, updating the design, and maybe even doing a bit of renovation. Here are several great ideas to make your kitchen the best room in the house. How many times have you cleaned out your drawers and made everything look fantastic, only to open them a few weeks later and discover that everything has gotten cluttered again? No system is perfect, but there are some great drawer organization systems that can go a long way towards helping. Ikea offers these simple drawer organizers that help you to divide your cabinets with clean lines, and several manufacturers are even applying this idea to dinnerware with pegged dish organizers. You can move the pegs around as you need to fit your particular plates, bowls, and saucers, and never worry about where they're supposed to go. Everyone knows that mirrors work wonders at making spaces feel bigger, but few people think to use this knowledge in their kitchen. If you have a cramped cooking area, you can make it appear larger by adding in a mirrored backsplash. You'll open the space up with reflections and create a brighter, cleaner look. Redoing your entire kitchen can be prohibitively expensive, but that doesn't mean that you can't use frugal tips to make it look like a new room. Convince people that you replaced your cabinetry by getting new doors. Some places even offer them unfinished for as little as $9.95 per door! Alternatively, you could paint your current doors a different color and simply pick up some fancy new hardware. Another piece of hardware that can make a big impact is your sink and faucet. Change out both, and you can have a truly different look in your kitchen, especially if you're going from a traditional metal sink to one made of stone, china, or even glass. Of course, some sinks can cost in the thousands. For many, that's probably too expensive, so if that's you, make an impression with a new designer faucet. You can even help the environment by getting one that's low-flow. One great way to get organized and revitalize the look of your kitchen is to utilize the vertical space  especially the space underneath counters. If youre really feeling in the mood to change things up, you can get a cabinet that suspends your microwave over the stove and free up more of the counter. Those looking for something a bit easier, though, may want to try a hanging pot rack or a hanging wine rack. If you have a small table in your kitchen or a breakfast bar, the kind of seating you use can make a big statement about the room. Are you stately and refined, or sleek and modern? Even changing out something seemingly small like your seating can greatly affect the overall look and feel of your kitchen. Perhaps just as important, smaller chairs can give you more space and make your kitchen feel bigger than it really is. About the author: Jillian Watkinson is a DIY expert and has written about home and gardens for many years. You can find other examples of her writing on The Design Inspirationalist, The Kitchen Blog, and Pegasus Lighting. When she’s not writing, you can find her covering Community Home Supply and other useful supply companies for various projects. Editor's note: This post is part of LHITS DIY Linky and The Homestead Barn Hop. We are moving in a few weeks. I don't want to get into too much about it now, lest I jinx the process, but sufficed to say there are lots of cleaning and arranging movements happening around here. Hence all the talk of purging. I've also been getting this house ready round the clock for new potential renters to come check it out.